This Peterbilt Potbelly Livestock Truck Cake was my first fondant cake that I made for my nephew Trevor on his 7th birthday. It was going to be a surprise to him as to what the cake would be, but we knew it had to be this Peterbilt- he “LOVES” it. The cake was a challenge and took almost 4 days to complete. We ordered 23 various flavor sheet cakes to make this monster. It was 31″ long and weighed almost 40lbs. I started with the trailer first, thinking this would be the easy part. Huh, by the next morning the fondant and cake was about ready to split right down the center and it looked horrible. My mom and I put our heads together and decided to tear it down and start over by adding extra support and tiering the cakes differently. I didn’t realize you needed a structural engineering degree! The trailer was white fondant and I airbrushed the silver on. The lights, breather holes and license plate that said “TREVOR” were all made out of fondant. The tractor part was next, that I sculpted with a knife to get the shape. This also was done in white fondant and airbrushed in a red color. The smoke stacks, fuel tanks, steps, mirrors and air cylinders were all created out of fondant and airbrushed with silver and placed on the cake with toothpicks. The tires were made out of cupcakes and rolled up in fondant. Now, the hard part, we had to transport the cake to Trevor’s house for the party – 11.7 miles away and it barely fit in the back of the vehicle. 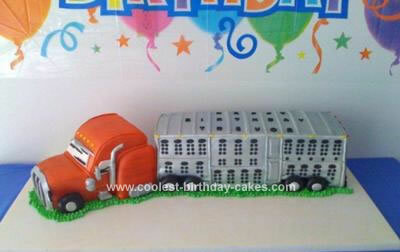 The cake made it and Trevor liked his Peterbilt. Word of advice, if you are going to be doing any airbrushing on a cake, try to do it outside. My mom was still seeing red through out the entire house weeks later. Sorry Mom. That is such an awesome cake, it’s exactly what I was looking for:) My nephew is turning 5 in a month and he absolutely LOVES trucks so I’m making him a truck birthday cake, hopefully it turns out lol.. Thanks.. I am having a baby shower in July and would love a semi cake for my shower! You did such a great job!